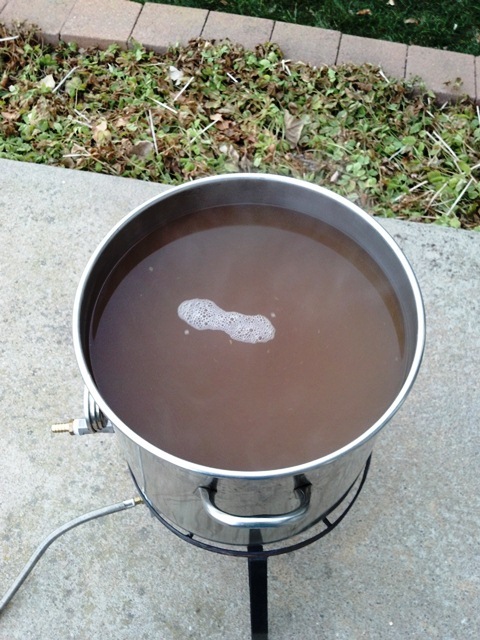 I got through the mash with 8 gallons of wort in the pot and lots left to come out. 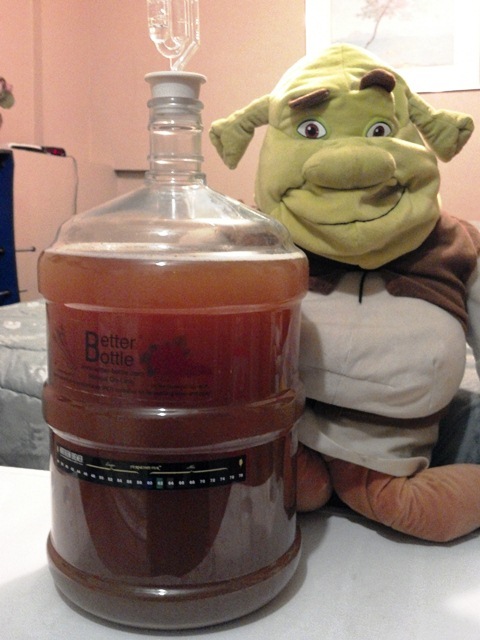 Apparently the mobile Beer Smith droid app had me use an extra 2 gallons of sparge water. Very uncool. Worse, the OG was 1.031 which was a full 11 points lower than I wanted. This made my mash efficiency a little over 65% compared to my usual 80-something-%. I'm not sure the 2 extra gallons of sparge water completely explain my low efficiency. I actually also think that I didn't get a full 10 pounds of malt from the LHBS. It was the LHBS that I don't go to as much, and their milling setup is not nearly as nice as my usual place. I think some of the grain floated to the sides of the bucket I was collecting the milled grain in. I was very close to just giving up and dumping the batch, cutting my loses and living to brew another day. But I decided to boil an extra hour and fifteen minutes or so. Other than the extra time, the boil went fine. I adjusted the hops a bit, which probably won't make a huge difference. Somehow, I ended up with almost 5 gallons in the fermentor with an OG of 1.052. Coincidentally, this was my planned OG, although I had planned on getting a bit more than 5.5 gallons. I was able to pitch right at 60 degrees, which was (as always) my goal. So, I think this beer will turn out fine. I actually think it will be a great hoppy APA. Unfortunately, if I have created the perfect beer, I am not sure I can recreate it. I don't know my mash temperature, and I am not sure how much grain I used. I do know how much extra sparge water I used, but I don't know exactly how much extra time I boiled. I think I am going to have to brew next weekend just to get the taste of this brew day out of my mind. Oh well. At least the 42 SMaSH will be nice to drink. And at least the Bears beat the evil Vikings today.